Few startups are lucky enough to win backing from big investment firms, so innovators have drawn on the power of social media. Kickstarter allows people with an idea to appeal directly to potential financial backers. By collecting hundreds of small donations, new companies can get off the ground. Now a new site has adopted crowdsourcing for research projects. On Petridish.org investigators can explain the benefits of their projects and seek funding. So far the projects seem to involve wildlife conservation, which may make for more visually appealing descriptions. But any scientist can take a turn explaining the benefits of their research. Online donations in amounts as small as $20 may not fully replace NIH funding, but it can support small projects and potentially demonstrate to larger funders that people see value in your projects. We think of lab mice as a relatively inexpensive way to do research. 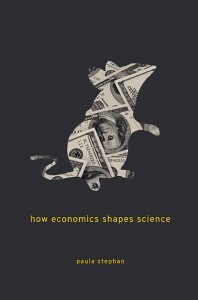 But in her new book, How Economics Shapes Science, economist Paula Stephan shows that some scientists spend $200,000 a year just maintaining mice populations. One of Stephans’s most provocative arguments is that staffing of labs represents a “pyramid scheme” because many PIs prefer cycling in postdocs to permanent staff technicians. As a result, doctoral students in biomedical fields find it increasingly difficult to land stable jobs. She recommends either decreasing the number of Ph.Ds produced or being very explicit with incoming students about their job prospects. The most worrying conclusion of the book is that scarce funding has made scientists risk-averse. That is not what I have seen among my colleagues, but I can imagine the pressures to propose a more familiar project when a scientist’s continued employment depends on receiving funding.